I’ve used a lot of note taking apps over the years. I like to keep my notes available on multiple devices, and ensure that they are backed up in multiple places so that I don’t lose them. I try to type everything that I post on any of my websites in a separate program first, and to copy and manage them when I’m ready to post. One of the problems that I’ve found with most apps on the market is that they are made only for Mac and Apple products. While I use a Mac as my main computer, I use Android for phone, and I can’t guarantee that I’ll always stick with this platform. Note taking apps like Bear and Ulysses look nice, but I’m hesitant to buy an app that isn’t future proofed a bit knowing how fickle I am with technology. Honestly though, it’s still top of my list for all but a few features. I greatly enjoyed the OCR feature, which allowed me to scan and save lots of old useful documents and to be able to search them when needed. Being able to pull up an invoice from a few months prior while talking to an unhelpful mechanic was an opportunity for me to realize how useful it would be to have all of my documents available to search and display at any time. Eventually I want to set something up with a document scanner and a tool like Paperless, but right now that requires more setup and management than I want to put into it right now. 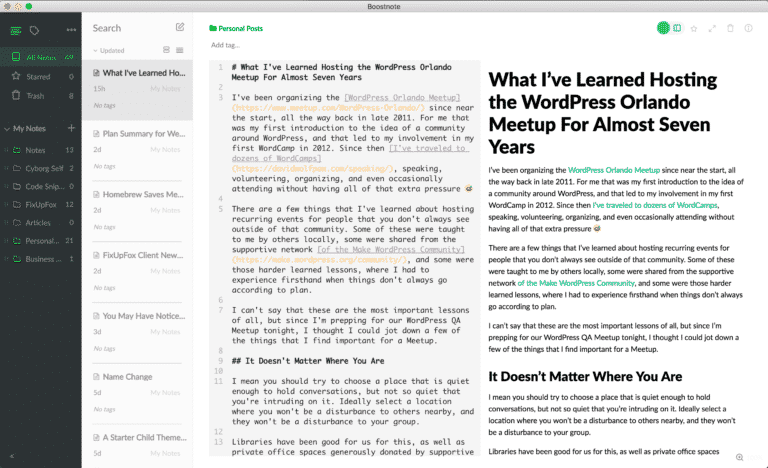 Markdown is the main reason that I stopped regularly using Evernote. I could survive without it as it’s not a requirement for me, but the high support across a variety of platforms, including WordPress where I post most of my content, makes it useful. Evernote doesn’t work with code snippets, and while there are alternative Evernote clients like Alternote and Marxico, I still need to set them up through Evernote, and they’re not always well supported. Plus, I lose the ability to use them on my phone. 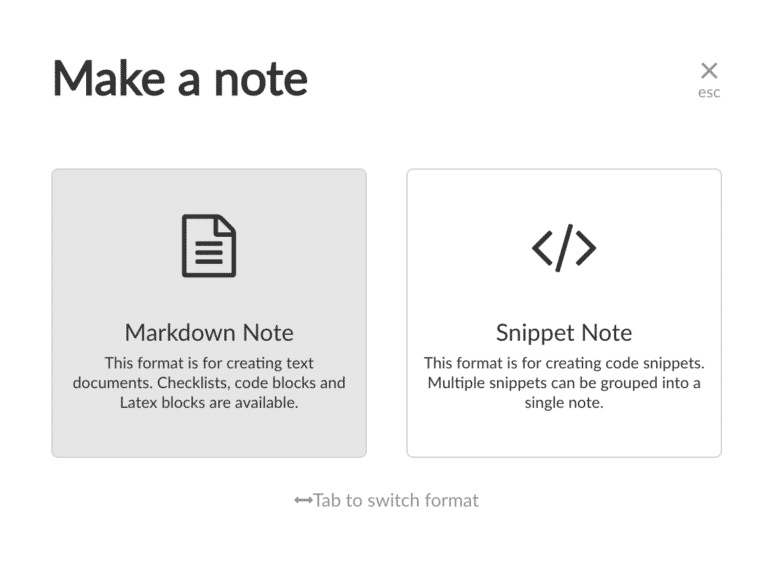 While hunting around a few months ago, I found Boostnote, an open source, markdown driven note taking app that promises to “Boost Happiness, Productivity, and Creativity”. The cloud syncing is useful, but the mobile app only has preference for Dropbox for now. Basically since you can set where your notes are saved, selecting a folder in a synced service lets you keep them backed up safely. You can also choose keyboard shortcuts based on vim or emacs if you are used to using either of those command line editors. Importing text and markdown files is as easy as dragging them into the app. You can even import from Evernote with ever2boost, though it’s a command line tool that requires a bit of setup. Notes can be printed to PDFs if you want to share them in that format. They can also be exported as text, markdown, or HTML files. Speaking of HTML, there is a setting to control the level of sanitization for HTML, which is nice to keep from accidentally breaking documents with pasted code or content. The main plus for me is the code snippet feature. I can create shareable code snippets in their own files with a high level of syntax highlighting support. I can also toss bits of code into normal markdown notes, which will translate to display properly when I paste into WordPress. Considering how often I like to do that, it’s probably the first feature that is missing from Evernote that I’d want to start using that again. The app is not perfect. Like every note app, there are features that another app has that I wish that it had, and there are features that it has that if I could transport into another app I might start using that one. An example is storage methods on the mobile app. Since you can set up a folder in a cloud sync service to allow you to access the same notes on mobile, I’d like to be able to set that as my default and have it cache data, so that I don’t need to reload all notes every time I want to use it on mobile, or not accidentally forget to switch and have it stored in mobile only. Whenever I open the mobile app I’m greeted with a sad, empty screen. There is no spellcheck in Boostnote. Coupled with a bug that currently exists in Gutenberg where spellcheck does not run on pasted content, I have to manually move through all of my content to ensure that it is not misspelled. One thing that Evernote and Marxico have are the ability to work via a web interface. This would necessarily be more difficult in a self-hosted app like Boostnote, but it’d be a nice feature for someone wanting to manage a secure hosted environment, so I could access and edit notes on devices that I don’t have synced with my data. There are some quirks to Boostnote that I’m hoping will get updated soon, like the ability to use keyboard shortcuts to jump to the beginning of the line that you are typing on as opposed to the start of the row. I can’t say I would have a workaround for this without line breaks or carriage returns, but I can hold out hope. When you copy a link into Boostnote it grabs the meta title for that link and creates markdown for you, but then it doesn’t update the cursor position. I will again point out that this is an open source project, and I am lucky to get so much for free already. I just like the idea that I could submit issues on Github and potentially have someone who knows more about this than I do work up a solution. If Evernote handled code better, I’d probably pay to switch back. If Marxico had desktop (and preferably mobile as well) apps, likewise. Right now Boostnote isn’t perfect, but it’s the place that I get most of my writing done. I’m going to check out some of the new apps that I found while writing this post. 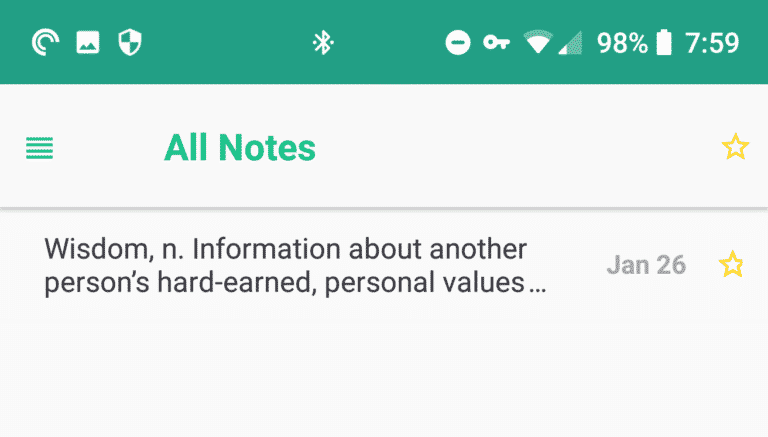 Do you have a note taking app that you swear by? What features should I be looking for? Recently came across Boostnote. Ticks my boxes, except I need an Android client which is not currently available. – Storage under my control. Not some anonymous server on the Internet. 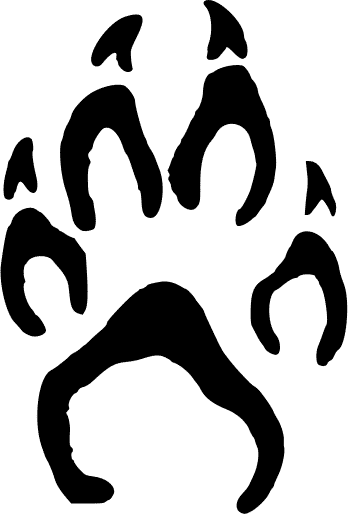 – Either a web interface (self-hosted is fine) OR both a Linux and Mac client. How’s that list grab you? Outside of the app, I agree with your list, but now consider Markdown to be a need as opposed a nice-to-have as well. Frankly, most of the things that you suggested should be table stakes for any note app moving forward. I’m not sure how I feel about folders as a need anymore, as I’m trying to get better at treating notes like email: rather than sorting them into folders I rely on search to surface things now, saving lots of time in the sorting process (when they can’t be filtered automatically, that is). I’ve actually been looking back into Simplenote after a demo of some new features that I got last week from one of the maintainers. It’s gotten better about import/export as well as Markdown support. So far it’s feeling a bit better to me than it has in the past. I was so frustrated with these tools when it came to import/export functionality, I kind of want to write a “universal” tool to transfer data between various note systems. There are Python bindings for the Simplenote API (my current note app of choice), so it’s not too hard to automate backups. I’m amazed at the lack of apps that meet my (and, it seems, your) list of requirements.